The word “simplify” has become a buzzword in society the past few years. There is even a magazine called “Simple Living” that will sell you things (including a magazine) to help you simplify your life! I often write editorials on simplifying things. For months I had been having an ongoing problem with my feet. They were aching and sore and painful and swelling. By evening they were the worst. Using all my healing knowledge I did everything in my power to figure out what was wrong and to heal myself. I thought of water retention and drank nettles tea. I considered that I was perhaps eating something that was causing this problem. Perhaps too much salt or sugar or bread? I considered diseases and problems I could have…perhaps this was an indication of something more major? My mind was turning with possibilities and I tried numerous solutions, Some worked a little bit, sometimes the problem would come and go…but nothing took it away. I imagine if I had gone to see doctors or healers the result would have been the same. And I was considering that route, when I opened up a small neighborhood newsletter and something caught my eye. It was a small ad by a local podiatrist who talked about how people were suffering from a “disease” that was caused by not wearing shoes or not wearing the proper shoes. I thought it was a bit funny that this “disease” actually had a name…but when I read over the “symptoms” I realized that wearing some shoes or slippers around the house would at least not cost me anything to try. That was six weeks ago. I have not had any trouble with my feet since. I didn’t need to be told I had a disease and I didn’t need a name for what I was suffering from, although there seems to be one. However, what I did need was a reminder at how simple the solution could be. And the solution did seem to make sense. I know the health benefits of going barefoot in the grass. I don’t like wearing shoes. 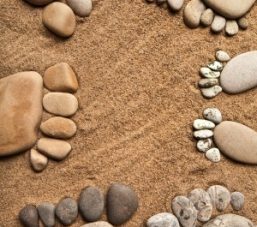 However, it does make sense that our feet were not created to walk on cold tile or bumpy carpet all day and they may get sore after a day of doing that. So this is just one more reminder for us all…look for the simple and obvious solutions first. Then, progress to the complex. STEP ONE: Problem presents itself suddenly or problem presents itself as ongoing. STEP TWO: Check if the person gets enough sleep. If the problem is sudden like a headache, pain or indigestion ask them (or yourself) how much sleep they have gotten in the past three days. If it has not been sufficient, then make sure the person catches up on sleep before they consider other routes of healing. STEP THREE: Along with checking on sleep, check on water intake. Is the person drinking 8 glasses of water a day? Are they drinking soda, coffee or green teas which would actually subtract from their water intake total? If their water intake is low then immediately have them drink a glass of water. Proof that this works? I cannot tell you how many headaches or cases of fatigue I have “cured” with one or two glasses of water! STEP FOUR: Check diet. Has the person had enough protein? Some people need enough protein to be able to function at their optimum levels. Have they eaten too much bread, sugar or fried foods? Have they consumed MSG? MSG can cause heart palpitations, diarrhea, stomach pains, headaches, insomnia and much more. I have personally either experienced these symptoms or witnessed them in others on an ongoing basis. Does the person have allergies and they have been consuming a lot of food they are allergic too? Have they been eating too quickly and not chewing enough? I have a client who was going to go to the hospital with abdominal pains until they visited the bathroom and saw about 15 whole blueberries in the bowel. Apparently they had been in a great hurry when consuming their blueberries. Has the person eaten a lot of acidic foods? A highly acidic state can cause great pain and many illnesses, and sometimes even death (this is how many atheletes have died – by creating a highly acidic state in their body with high protein meals and then exercise soon after). If a person has eaten a lot of acidic foods in the past few hours or days, having them consume an alkaline drink or meal may help balance things out. STEP FIVE: Is the person performing a repetetive activity? Many people don’t realize that any repetetive activity they perform (video games, computer work, typing, sitting, driving, etc…) needs to be balanced and rationed in some way or they will suffer in some way. STEP SIX: Is the person upset about something or recently experienced a big change or trauma of some sort?